At the 2011 Catechetical Ministry Day for the Diocese of St. Augustine, I was invited to do a workshop titled “Praying with Technology.” I must admit that as I began to develop the workshop, I was not sure what I would include in the presentation. The insight I gained is that tools have always been used in prayer. Tools like parchment to record our Sacred Scriptures with the psalms and words of Jesus as he prayed and more. The printing press allowed us to create a variety of prayer resources. We often use a pen or a pencil to record the prayers that we want to share with others. In today’s digital culture, we now have different tools to use. To name a few: laptop or desktop computers, iPads and tablets, iPods and MP3 Players, a Blog, a Wiki and more Web 2.0 tools than you may be aware of. Let’s just take the words of the Our Father and create a word cloud with them. You ask – So how could I use a “Word Cloud” with my students? Following are a couple of suggestions. I encourage you to reflect on how you might use a “Word Cloud” with your class, RCIA members, youth groups, and any group you are involved with catechetical ministry. 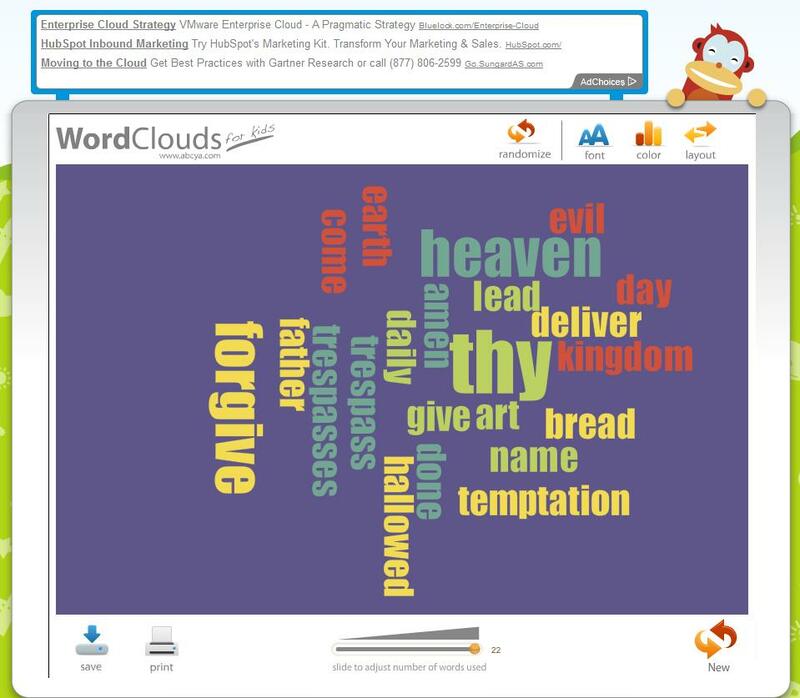 Create a word cloud with one of the word cloud tools. These services usually allow you to embed the code into your blog, or forward a link to others via e-mail, or you just may want to save the graphic image of this word cloud to use in a PPT presentation. You’ll notice in the graphics I’ve included that there are key words that stand out. Perhaps the students could guess what prayer this word cloud represents. 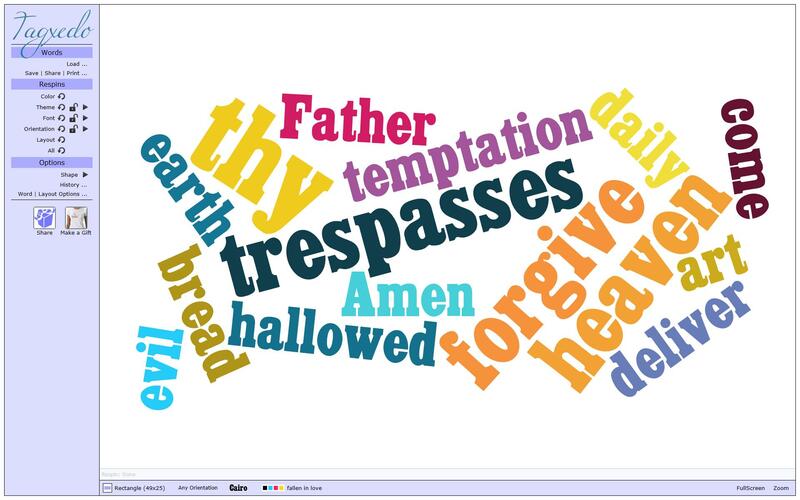 Add the Our Father word cloud in a PowerPoint guided prayer at the point where you would say the Our Father. When they see the prayer cloud, they would – in this case – say the Our Father together. Invite your students to go home and create a Word Cloud using the week’s assigned prayer that they are learning this week. Then direct them to come to the Class Wiki. They can “embed” the code of this graphic on their page and in 50 to 100 words, they can respond to the following: When you pray (Name of Prayer), if you had the opportunity to rewrite this prayer in your own words, what would you say to God? Or, any other assigned task. Create a Wordle for 10 Different Prayers. Then add these graphics to a PowerPoint. As a brief quiz to see who is able to identify the prayer they represent, using a response system like Quizdom (or just plain cell phones and Poll EveryWhere invite the students to identify the prayers that the word clouds represent. As you become comfortable with “word clouds”, and use this type of activity with your class, remember to come back to this blog post to share your story. Your story is important! Remember to click the LIKE button!